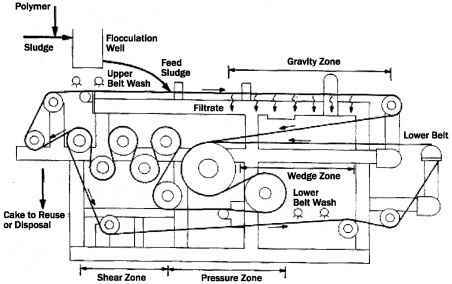 which sludge stabilization can be accomplished with a practical SRT. Most anaerobic digesters are designed to operate in the mesophilic temperature range 30 to 38°C (85 to 100°F), 35°C (95°F) being the most common. 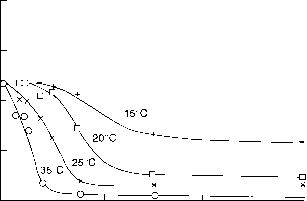 Some digesters are designed to operate in the thermophilic range 50 to 57°C (122 to 135°F). greater than 1°C/d. Changes in digester temperature greater than 0.6°C/d should be avoided. Methane-producing bacteria are extremely sensitive to pH. 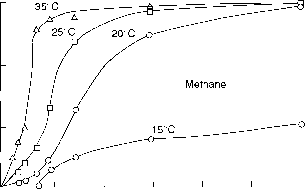 Optimum pH for methane formers is in the range 6.8 to 7.2. 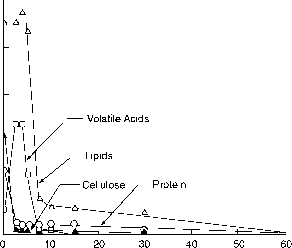 Volatile acids produced in the acid-forming phase tend to reduce the pH. 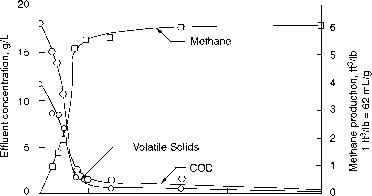 The reduction is normally countered by methane formers, which also produce alkalinity in the form of carbon dioxide, ammonia, and bicarbonate. 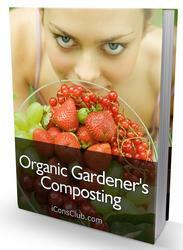 In the anaerobic digestion process, the carbon dioxide-bicarbonate relationship is very important. 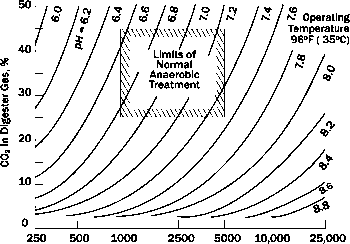 Figure 5.4 shows that the system pH is controlled by the carbon dioxide concentration of the gas phase and the bicarbonate alkalinity of the liquid phase. If the proportion of CO2 in the gas phase remains the same, addition of bicarbonate alkalinity will increase digester pH. The best way to increase pH and buffering capacity in a digester is by the addition of sodium bicarbonate. Lime will also increase bicarbonate alkalinity but may react with bicarbonate to form insoluble calcium carbonate, which promotes scale formation.